Is cold weather causing your joint pain? Listen to your body. If you’re feeling aches and pain in your joints during the cold season, be easy on yourself. Warming up before that daily run can help reduce that pain and prevent inflammation. Cold weather can restrict muscle flexibility, increasing the risk of injury. Stretching before any activity can help decrease that risk. Staying warm by wearing layers will help maintain your core body temperature, muscle flexibility, strength, endurance as well as reducing joint pain. 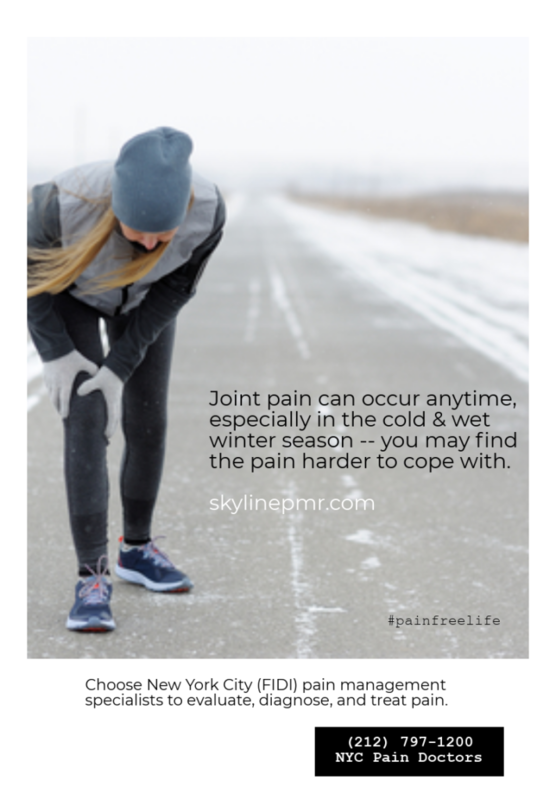 A common complaint in the winter among most Skyline PMR patients when the weather starts turning cold in the months of November, December — “my joints are throbbing”. According to Dr. Monfett an NYC pain medicine specialist “An increase in pain associated with cold weather happens when there’s a sudden change in atmospheric pressure before it rains. Some patients believe they can tell when its going to rain because their joints ache. Medically this is probably because there are small amounts of air in the joints which expand as the atmospheric pressure drops and then the pressure in the joints equalizes over a few days.” suggests Dr. Monfett. But barometric pressure often drops before bad weather sets in. This lower air pressure pushes less against the body, allowing tissues to expand — and those expanded tissues can put pressure on the joint. Shorter days and cooler temperatures can cause us to be less active, and immobility can also make arthritis pain worse. (It reduces the flow of nutrients and oxygen to joints.) Cold weather can affect several conditions leading to pain, numbness, or weakness in the lower back, buttocks, or legs on one or both sides. Cold weather can cause sciatica pain symptoms to worsen. Cold Weather Joint Pain Listen To Your Body. If Pain Worsens See A pain Specialist To Identify What May Be Causing Your Joint Pain. Call 212-797-1200 to schedule An Appointment With Dr. Monfett.